Dentures have long been the go-to solution for patients who are missing the majority of their teeth in either the upper or lower arch of their teeth. The design of dentures is relatively simple. Prosthetic teeth are attached to an acrylic mould that sits over the top of the patient’s gum. This mould can be worn without any other type of attachment, but many patients opt to use denture adhesive to give their device additional security and to help prevent it from moving around inside their mouth when they eat, drink, speak, laugh or sneeze. Dentures slipping and moving around when eating, drinking, laughing etc, which can cause the patient to feel embarrassed or self-conscious. Dentures needing to be removed at night, or to be able to enjoy certain foods or activities. Regular maintenance required to keep dentures in good condition. Dentures breaking easily when dropped. Dentures no longer fitting properly. Improperly fitting dentures are a very common problem when someone has had dentures for some time. This is because once you lose your teeth, your body recognizes that you no longer have tooth roots in your jaw bone that require support. As a result, it naturally redistributes the materials that would ordinarily support the roots of your teeth to elsewhere in your body. Unfortunately, this eventually causes your jaw bone to shrink, meaning that dentures can start to become too big to fit properly. Many patients believe that if they don’t like their dentures, there is no alternative available. This, however, is not entirely accurate. Many patients who have previously worn dentures may still be considered a good candidate for another solution for missing teeth – dental implants. Dental implants are an innovative tooth loss treatment that allow single or multiple prosthetic teeth to be placed into the mouth and secured directly to the jaw bone using a metal post. This post has been pre-inserted into the bone, so the bone grows around it, creating a virtually unbreakable seal. The prosthetic crown that makes up the visible part of the tooth is then connected to this post, creating a tooth replacement that looks and feels like a natural tooth. If a patient has multiple missing teeth, these can be addressed using implant-supported dentures which take the design of conventional dentures and combine it with implant technology to ensure that dentures have the best possible stability, comfort, and aesthetic appearance. Greater stability, ensuring that the prosthetic teeth do not slip and slide around. Permanence. There is no need to remove anything to enjoy the foods that you would like. Improved appearance over dentures, affording patients better discretion. Greater durability. With care and attention, dental implants can last a patient a lifetime. While it is entirely possible to switch to dental implants after dentures, a number of considerations will need to be made. Firstly, your dentist will need to assess the health and density of your jaw bone. For dental implants to be successful, your jaw bone and the soft tissue of your gums needs to be healthy and strong. ​​​​​​​If you are a patient who has found that their dentures now seem too big, your jaw bone may have already started to shrink. If this is the case, you may need to have bone grafted in to your jaw to build it up so that it can sufficiently support an implant. Bone grafting is a relatively simple procedure, but patients usually have to wait between 4 and 6 months for their implant procedure, during which time the new bone must fuse to the old, reinforcing and strengthening it. 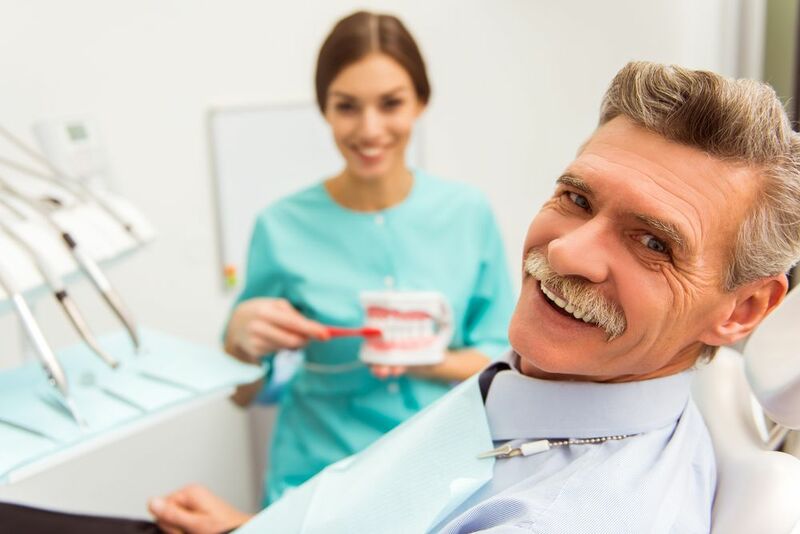 If you currently wear dentures and are considering switching to dental implants, our experienced and professional team would be happy to schedule you an appointment to determine if this is a possibility for you. Please contact our office today to arrange your consultation.